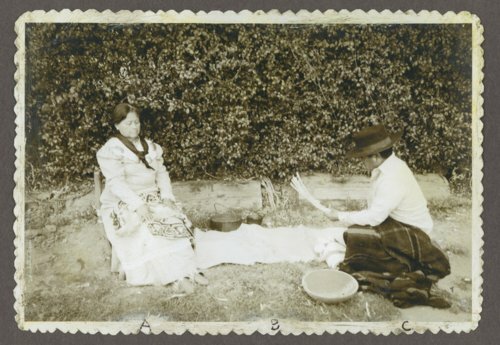 This is a photograph showing Mrs. Rosan Potts Ke-o-ko-mo-quah and Wallace Stem-son, both members of the Potawatomi Prairie Band, sitting near a straw reed mat, iron kettles and wooden bowl. They are preparing for Mide, Native American religious practices. Wallace Stem-son holds Mide sticks and Rosan Potts holds a beaded bag and hide. In the background is a long hedge on Potts' allotment on the reservation near Mayetta, Kansas.